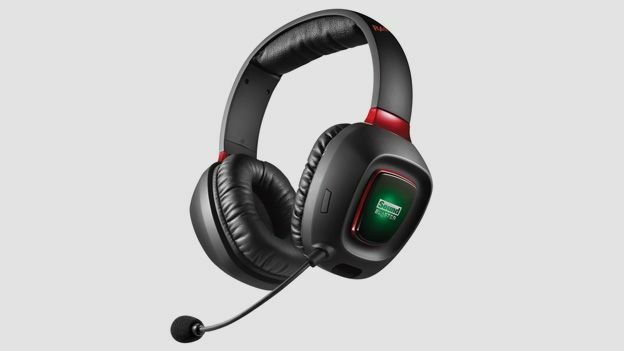 How good is the Creative Labs Sound Blaster Tactic 3D Rage Wireless gaming headset? The Creative Labs Sound Blaster Tactic 3D Rage Wireless gaming headset comes in at a wallet-friendly £79.99. So where's the catch? Creative Labs' renown exists mainly on the back of its sound-cards, which have achieved sufficiently high levels of quality to wean many a musician from their beloved Macs and over to PCs, so entering the gaming headset market was a logical step for the company. However, it made that move quite recently so, understandably, kicked off with top-end efforts like the Creative Labs Sound Blaster Recon 3D Omega. So, the Creative Labs Sound Blaster Tactic 3D Rage Wireless, with an RRP of £79.99, marks its first foray into the mass market. This could have been a dangerous exercise – if it skimped on sound quality and features, you could accuse the Sound Blaster Tactic 3D Rage Wireless of ruining Creative Labs' reputation, whereas if it was too good, you'd question the wisdom of spending in the vicinity of £200 on a headset. Luckily, it does a good job of straddling that dichotomy. Features-wise, it's very impressive for the price. You get a USB stick which handles the wireless, the actual headset looks and feels remarkably like its more expensive sibling (although the plastic on the ear-cups is cheaper and more prone to scratching), and it provides 3D surround sound. It's reassuringly robust (bar the aforementioned scratchability) and very comfortable indeed. The microphone boom can be set to your favoured position easily and is also robust. It's dead easy to set up: just charge it up via the USB cable (for eight hours, says Creative Labs), plug the USB dongle in and it should work. It also pays to download the free control panel software from Creative Labs' website, which lets you adjust the sound and even specify a colour for the glowing centres of the ear-cups. If you do find that you've got to synchronise it with the dongle manually, though, you'll have to head back to the website, as the Quick Start guide is terse, to say the least. So what, then, of the sound? Naturally, it pales in comparison with the Sound Blaster Recon 3D Omega: the Tactic 3D Rage Wireless lacks its more expensive sibling's stunning dynamics, generally sounding flatter and less dramatic. But it still sounds good – much better than you would anticipate for the price. There's no deep, verging-on-the-subsonic, rumble but the bass is still crisp and sufficiently meaty, and the treble remains clear without even a hint of tinniness or any tendency to shriek. The overall sound is warm and inviting, and a bit of rummaging around in the control panel's equaliser can make it sound a lot better than it does on its default setting. The 3D works, but not brilliantly, although you can again improve that from the control panel. You still won't be able to hear every single bullet winging around your head, or the direction of footsteps approaching from 80 yards away, but you'll still get a sense of whether enemies are to your left or right before you're reduced to a quivering frag-heap. Top-level Call of Duty or Battlefield players will no doubt feel the need to invest in a headset with more precise 3D sound, but the Sound Blaster Tactic 3D Rage should be fine in that regard for the rest of us mere mortals. The Creative Labs Sound Blaster Tactic 3D Rage Wireless (note to company: can we have a shorter name next time, please?) is as good a headset as you could hope for with only 80 quid to spend. While its sound lacks the drama, and its 3D the precision of the most expensive gaming headsets, it still has all the quality that PC and Mac MMO players and even the more occasional competitive FPS-heads require. It does a good job of taking Creative Labs to the mass-market without cheapening its reputation. If you're a keen – but not obsessively so – PC or Mac gamer, we would be very surprised if it didn't meet your gaming headset needs.